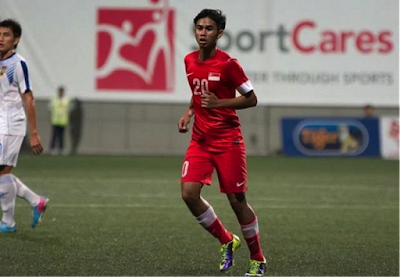 Adam Swandi is a name you might not have heard before but the young attacker could be on his way to the J League. Swandi is a 22-year-old Singaporean making big strides in the game. As the Singapore paper this week reported on the up and coming player looking to play in Japan. The player is currently with Albirex Niigata in the Singapore top league. His side is top of the league and already champions with six games to spare. His promising displays have caught the eye of J League 2 side Albirex Niigata. With the Singaporean side being a parent club to the Japanese team. While Adam is already standing out as he is the only Singaporean to play for Japanese side Albirex Niigata in the Singapore Premier League. As despite being based in Singapore the side is full of Japanese players. His target is, however, to play in Japan and that dream is looking more like becoming a reality. As he is off on a trail with Albirex Niigata at the beginning of September for a week. While the chairman of Albirex commented "It has always been Albirex (Singapore)'s dream to have a Singaporean playing in the J-League. The higher the level players can play out can only help improve the national side so this is great news also for fans of Singapore. Meanwhile, the chairman talked about players from Thailand in Japan such as Chanathip Songkrasin (Consadole Sapporo), Teerasil Dangda (Sanfreece Hiroshima), Theerathon Bunmathan (Vissel Kobe), Jakkit Wachpirom (FC Tokyo Under-23) and Chaowat Veerachat (Cerezo Osaka Under-23). Except for Jakkit and Chaowat, the other Thais are playing in the J League 1, as they play against World Cup winners Andres Iniesta (Vissel) and Fernando Torres (Sagan Tosu). Adam will hope he can join these players in Japan and if he does secure a contract in Japan, he will be the second Singaporean to do so after Anders Aplin, who is currently on loan from Geylang International to J League 2 leaders Matsumoto Yamaga.